Learning to drive doesn’t always come easy. It demands the commitment and dedication of both you and your instructor It is a team effort. Please read the following notes carefully, If you do not agree with or understand any part then please discuss this with Ellison's School of Motoring before proceeding. Lesson fees will be quoted at the time of booking and may be increased at any time with a minimum of 1 month's notice. Fees may be paid by cash or by BACS payment, prior to the lesson. Block booking payments are due at the beginning of your ﬁrst lesson. Any refunds will be considered. However, any hours used will then be charged at the hourly pay as you go rate and the remainder will be refunded. 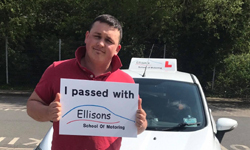 Make and conﬁrm all lessons with Ellison's School of Motoring head office or your driving instructor. Where possible, try to give as much notice as possible of dates and times you would like. This will allow you to book your lessons at times that are convenient for you - remember 20 other pupils may also be trying to book lessons in the same week. 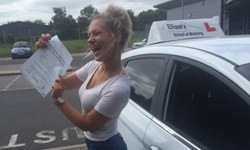 Lessons will only be classed as booked once they have been confirmed either by your instructor or our head office. You must give a minimum of 48 hours’ notice if you wish to cancel or change your lesson. Failure to do this will result in the full lesson fee being payable or hours lost if you have prepaid. If you consistently cancel without 48 hours notice you may be required to pay in advance for future lessons. You should agree with your instructor where your lessons will start and ﬁnish when making any lesson booking. Changes to your pick up and ﬁnish location will only be considered if good notice is given. If you request a different meeting or ﬁnishing place to that already agreed, your lesson may be shortened to cover any additional traveling time to avoid disrupting other lessons and tests. To avoid disappointment and/or loss of money please ensure you agree dates and times with your driving instructor prior to booking your test. Ensure that you bring the required documentation to your test. This is your responsibility. Documents required are detailed on your booking confirmation. If your driving is considered below the standard required for the test or it is considered you are not likely to reach the required standard in the time available. 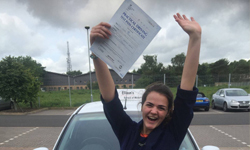 If your driving standard has been adversely affected by the cancellation of lessons for whatever reason. If you appear unwell or to be affected by the inﬂuence of alcohol or drugs including medically prescribed drugs. If any fees remain unpaid. Lesson and test bookings are accepted only on the express understanding that Ellison's School of Motoring will not be liable for any costs, expenses, claims or losses caused or incurred following her refusal or inability to provide a car/ instructor for any reason or test, for the lack of availability of any vehicle/ instructor for a lesson or test or from a cancellation of any lesson or test how so ever caused or for whatever reason.